Spiritual podcast-Metaphysical Romp 2. 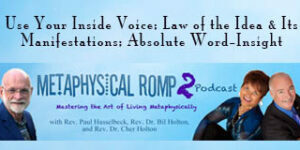 This week: Use Your Inside Voice; Law of the Idea; Insight. 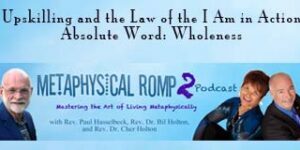 We explore the Law of the I AM in Action. Then we turn our attention to Bil’s book, Rev. Bil Unplugged and Unedited, taking a journey into Upskilling, and end with our Absolute Word. Spiritual podcast: Unquestioned Answers, Unself-consciousness, and the Principle of Health. Spiritual podcast-Metaphysica Romp 2, with Paul Hasselbeck, Bil Holton, & Cher Holton. Spiritual podcast discussing the Law of Health, Universal Substance, and the Absolute Word, Harmony. 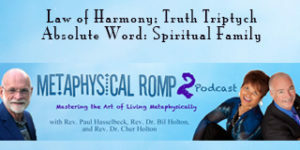 Spiritual podcast focusing on the Law of Harmony, Truth Triptych, Spiritual Family-2019Jan14. 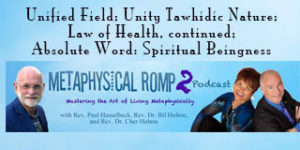 Includes a deeper dive into visualization and meditation. Spiritual podcast- this week we looked at the Law of Spiritual Growth, then explored the concept ofTruth Principle. 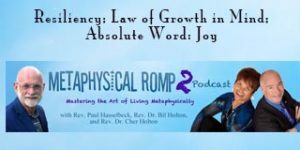 We discuss the Law of Growth in Mind; Resiliency; and share the Absolute Word Joy.